We all have an impressive inventory of LEGO blocks in our daycares. Because of their wide range of sizes and colors, boys and girls love to play with them. Of course, children have an endless imagination, but they may not have thought of the ideas in this article. 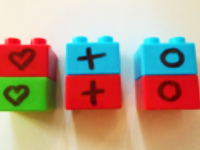 Read on for untraditional ways to have fun with LEGO blocks. 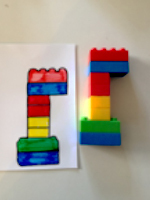 LEGO blocks are great for working on fine motor skills and encouraging children to reproduce shapes, an ability that is necessary for learning to write. Use blocks to create several simple structures. Set the structures on paper and trace the outline of each block that is part of your models. Color your models. If possible, laminate them, since little hands will manipulate them repeatedly. Add them to your LEGO blocks bin. Invite children to pick a model and reproduce it. Here, use blocks to create three-dimensional puzzles. Assemble several blocks and stick a picture or illustration on one side of your structure. Use an "Exacto" knife to cut around the edges of each block. 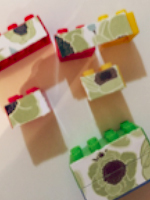 Deposit the blocks in a bag and let children manipulate them to recreate the picture or illustration. You can also use blocks as a motivational tool. Stick a star on each block to make them even more attractive. Select a challenge or situation you wish to positively reinforce. Give children a block every time they succeed the challenge, provide the correct answer for a game, or participate in an activity. Once they have collected all the necessary blocks, they can build a pre-determined structure. Write the letters of the alphabet on a series of blocks. Write several words on a piece of cardboard. To build a word pyramid, children will first have to use the letters (blocks) to write a six-letter word. They can then build a five-letter word on top of the six-letter word, a four-letter word on top of the five-letter word and so on. They must use your word list to successfully write the words. When their pyramid is complete, read the words with your group. Pick a theme (numbers, shapes, letters, animals, flowers, etc.). Draw a simple design on each block or use stickers. Arrange the blocks on a flat LEGO platform, forming a grid. The goal of the game is for children to take two blocks at a time, attempting to find matching items. If they are identical, have them stick the blocks together and place them in front of them on the table.